The Sidebar: "Unfailing, ever reliable" nutrition rating system developed by prominent experts at Yale, Harvard, other institutions quietly dropped by Big Y supermarket chain because it's "out of date"
"Unfailing, ever reliable" nutrition rating system developed by prominent experts at Yale, Harvard, other institutions quietly dropped by Big Y supermarket chain because it's "out of date"
In the mid-2000s, a (Griffin Hospital-based) team developed a nutrition scoring algorithm that aimed to improve upon existing nutrition labels displayed on products. In 2008, the hospital parent's for-profit subsidiary, GH Ventures, formed NuVal LLC with Illinois-based Topco Associates to market the system to supermarkets. 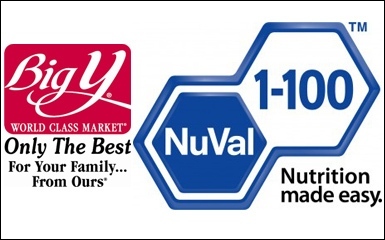 Today, NuVal ratings -- displayed on blue octagonal stickers -- can be found in the aisles of Big Y, Price Chopper and a number of other grocery chains. A 2007 29-page Griffin Hospital report called the nutrition scoring algorithm, "An unfailing, ever reliable guide to better nutrition both within and across food categories." Do they think the algorithm is "out of date"? And what's their reaction to Big Y dropping the program? That story's outside of my ken,* but seems like a newsworthy follow-up for another reporter or blogger. Incidentally, according to the Yale article, NuVal was dropped by Big Y in April. * The Yale Daily News article (for which I was interviewed) was primarily a journalism ethics story, part of which I reported in May.